Builder: Swan Hunter Shipbuilding, Wallsend, Tyne and Wear, U.K.
HMS Northumberland is a Type 23 frigate of the Royal Navy. She is named after the Duke of Northumberland. 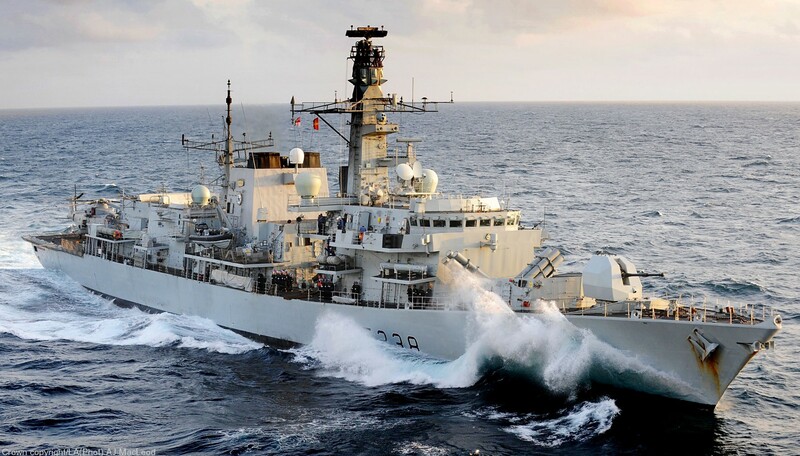 She is the eighth RN ship to bear the name since the first 70 gun frigate in 1679, and the ninth in the class of Type 23 frigates. She is based at Devonport and is part of the Devonport Flotilla. She was built by Swan Hunter in 1992 on the Tyne at Wallsend. She was launched by her sponsor Lady Kerr, wife of Admiral Sir John Kerr GCB DL, the former Commander-in-Chief Naval Home Command, in April 1992 and was accepted into Royal Naval Service in May 1994. After sea trials and going to F.O.S.T. she was deployed to the Falklands. 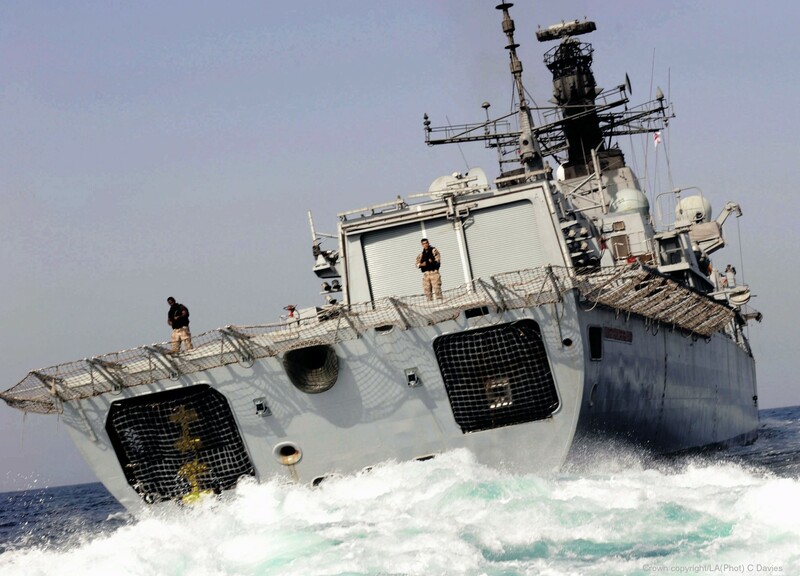 During her passage HMS Northumberland had to divert into rough weather to effect the rescue of a fishing trawler. During the diversion the ship allegedly struck a whale, although the damage was actually caused by the vessel "slamming" in high seas at speed whilst proceeding to the rescue. At Tenerife, after dropping off the rescued fishermen, the bow dome began to leak. The dome continued to leak during her resumed voyage to the Falkland Islands. The Northumberland had to remain at South Georgia undertaking fishery protection duties. When this was complete a dry dock was found in Rio de Janeiro that was suitable to carry out a bow dome change. Once better weather arrived she sailed to Brazil to be put into dry dock. She was escorted in by two ex Royal Navy type 22 frigates. Once in the dry dock the whale was discovered and subsequent repairs took three weeks at a cost of £3 million. Deploying to the Caribbean in 1999 for counter narcotics and disaster relief duties, she seized over two tonnes of cocaine (with a street-value of £135 million), in cooperation with a United States Coast Guard law enforcement detachment. From July 2004 to July 2005 she underwent an extensive refit at Number 1 dock inner at Babcock's dockyard in Rosyth, her first refit since build. This equipped her with an updated suite of weapons and sensors (e.g. a modified 4.5" Gun and the latest Low Frequency Active Sonar) and of propulsion and mechanical systems. Improvements were also made to the living quarters and a state of the art galley to feed the Ship's Company. Large areas of corroded deck have also been replaced. Also replaced were corroded areas of the flight deck, improving the lighting system that the pilots will use during night landings and installing a new helicopter handling system to move a 13-ton Merlin helicopter safely in and out of the hangar. (Although the Type 23 was originally designed to operate the Merlin, Northumberland had previously only hosted the much smaller Lynx.) 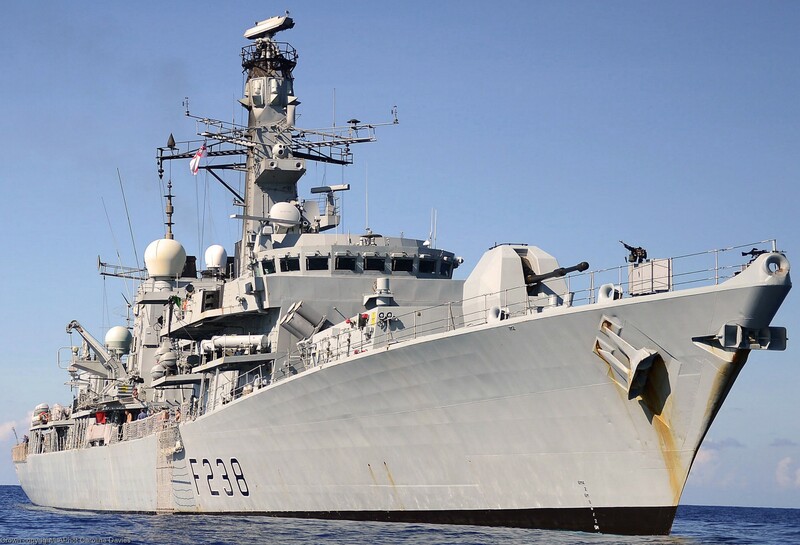 The combination of 2087 LFAS and Merlin ASW helicopter has subsequently proved highly effective and the class is widely regarded as the most capable anti-submarine frigate afloat. She rejoined the fleet at the Trafalgar 200 celebrations, then embarked for a period of sea training, starting with BOST (Basic Operational Sea Training) in January 2006, straight after the Christmas leave period. 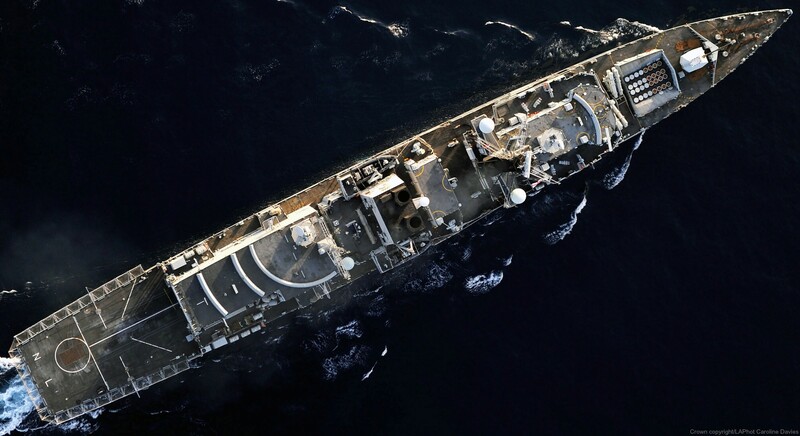 For a time during 2006 she then accompanied the submarine HMS Torbay on her deployment to the US AUTEC (Acoustic Undersea Testing and Evaluation Centre) which is based on Andros Island in the Bahamas. 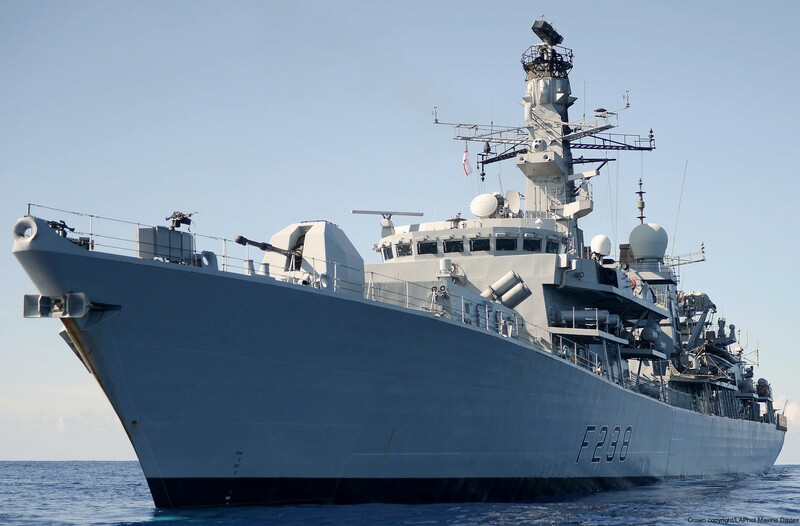 In 2007 she deployed to the Mediterranean as part of the UK's contribution to NATO maritime forces. 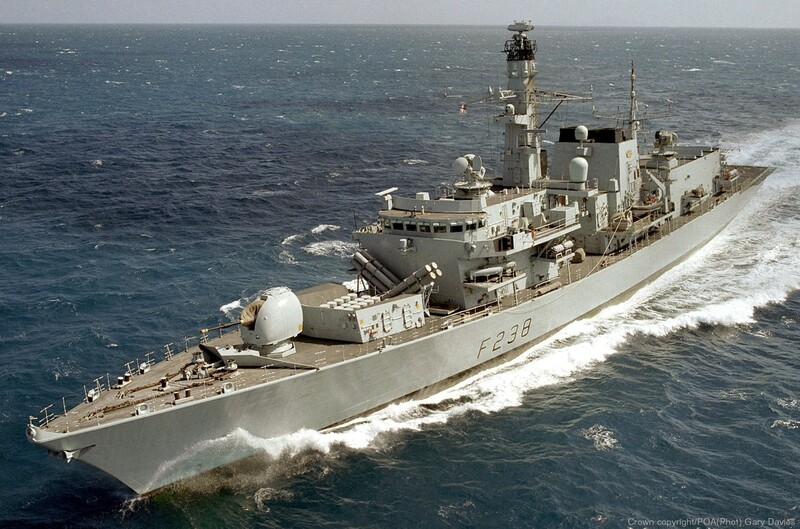 In 2008 she deployed to the Indian Ocean as the first RN warship to participate in the EU's counter piracy Operation ATALANTA, conducting numerous counter-piracy patrols in the Gulf of Aden and escorting World Food Programme humanitarian shipping between Mombasa and Mogadishu; this was partially documented in the Sky TV programme "Ross Kemp: In search of pirates". She deployed to the Indian Ocean again in 2010 for an eight-month counter-piracy patrol as part of the international naval counter-piracy task force, TF 151 and conducted numerous operations to disrupt piracy activity in the Gulf of Aden and the eastern Somali coast. She returned to the UK at the end of 2010 for an extensive refit in 2011. Her extensive refit at the beginning of 2011 included significant technology upgrades. 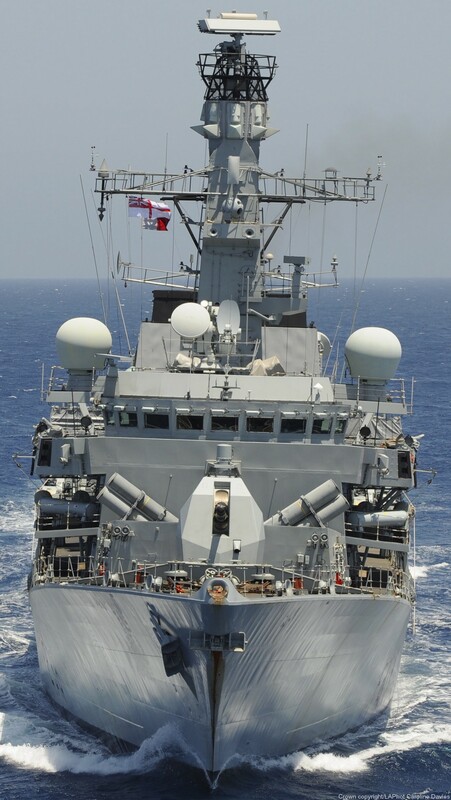 The Sea Wolf point defence missile system was upgraded with the Sea Wolf Mid-Life Update (SWMLU - pronounced "swimloo") which substantially improves the range, performance and reliability of the system. The combat system was upgraded from outfit DNA to DNA2, replacing the combat system architecture to improve redundancy and system performance, and a software upgrade which significantly improves overall functionality and sensor integration, as well as providing MMI convergence with the Type 45 destroyer's command system. Two 30mm BMARC cannons were replaced by two 30mm Automated Small Calibre Gun (ASCG) mountings. These allow remote control of the mount via operator consoles and integrated Electro Optic fire control. Additional modifications improved habitability and reliability in high ambient temperatures. 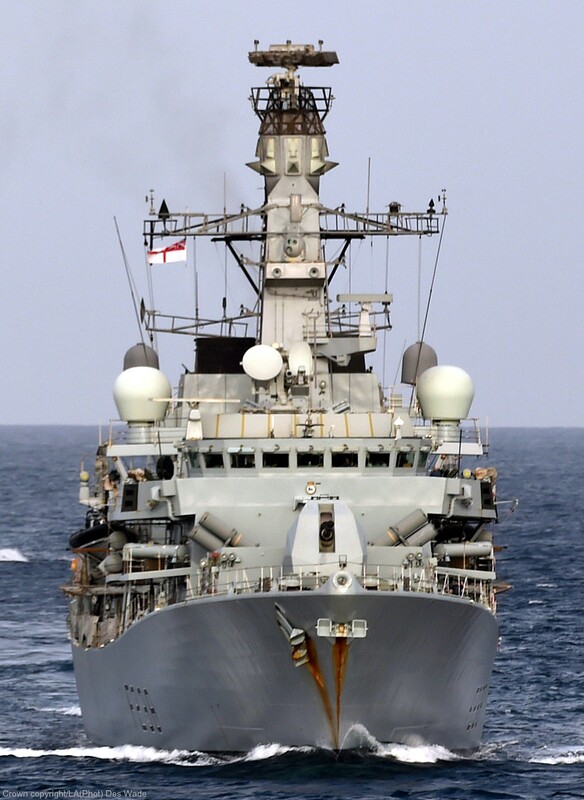 Emerging from refit in the summer of 2011, she completed her sea trials and weapon acceptance programme, conducting eight weeks of Basic Operational Sea Training (BOST) in early 2012. She deployed back to the Indian Ocean in the Autumn of 2012 for counter-piracy and counter-narcotics tasking. This included the successful capture and destruction of over £5M of cannabis resin from a smuggler in the Arabian Sea. She returned to the UK in May 2013. She participated in exercise Joint Warrior 2013. The ship has joined the COUGAR 14 Response Force Task Group deployment. The seat of the Dukes of Northumberland is Alnwick Castle, which is located in Alnwick, Northumberland. The family's London residence is Syon House in Brentford, which replaced, as their London residence, the demolished Northumberland House in the Strand. The traditional burial place of the Dukes is the Northumberland Vault in Westminster Abbey in London, the Percys thus being the last family to maintain such a privilege. Their family vault is however nearly full, and a new private graveyard has been created in Hulne Park near Alnwick.